A scenic wide angle view of the Golden Gate Bridge taken from the Marin County side of the bridge. In this picture you can see the start of the Pacific Ocean off the the right and the city of San Francisco, California off to the left. The Golden Gate bridge is arguably one of the world's most beautiful bridges as the Golden Gate Bridge is an internationally recognized symbol of San Francisco. 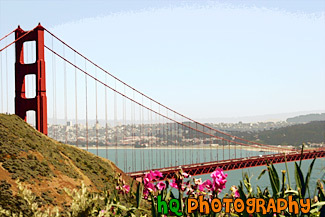 A scenic picture of the Golden Gate Bridge in San Francisco, California with pink flowers in the foreground. 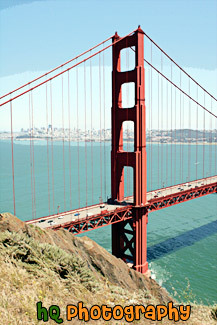 The Golden Gate Bridge is a historic symbol that represents the city of San Francisco. Joseph B. Strauss was the original chief engineer of the bridge and designed a rather unsightly cantilever and suspension structure in 1916. Though attempts were made to refine the design, it wasn't until consulting architects Irving F. Morrow and his wife Gertrude C. Morrow stepped in that the current look and design were imagined and implemented. The bridge opened for traffic 1937. A scenic picture taken looking down at the Golden Gate Bridge with the city of San Francisco seen in the background on this sunny fog-free day in the bay area. A scenic picture taken of the Golden Gate Bridge with some yellow wildflowers in the foreground near Hawk Hill in San Francisco, California. Hawk Hill is located just north of San Francisco, California in the Marin Headlands. From this position you are actually above the Golden Gate Bridge looking down at it and the city. In this picture you can see the Transamerica Building along with the Palace of Fine Arts. A scenic picture of the Golden Gate Bridge in San Francisco at night with a view of San Francisco city in the background. In the distance you can see the lights of the city lit up as well as the lights of the bridge. The Golden Gate Bridge seems to be "glowing" in this picture from the effect of night-fall approaching and city lights beginning to come on. 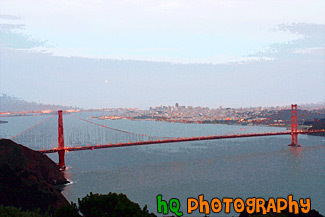 This picture was taken from the Marin Headlands (north side) of the bridge from a place called Battery Spencer just slightly after dusk. A scenic photo of fog covering the Golden Gate Bridge located in San Francisco, California. This picture was taken during the summer months when the fog really covers the Golden Gate Bridge. 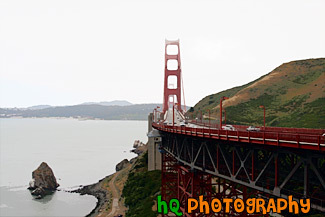 The real "Golden Gate" is the strait that the bridge spans. It was first named "Chrysopylae," meaning "golden gate," by Captain John C. Fremont in 1846. 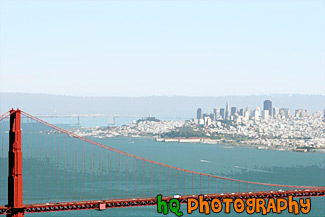 This photo was taken from the top of Hawk Hill which is located just north of San Francisco in the Marin Headlands. Total length of the bridge is 1.7 miles and the clearance above the high water is 220 feet. 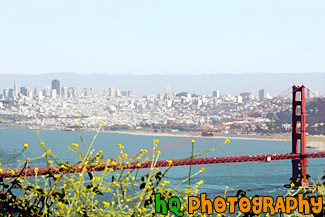 The photo was taken from the Presidio in San Francisco. Today the Presidio is enjoyed through the history and beauty it contains. 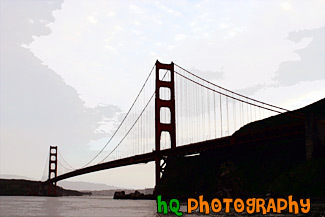 A scenic photo of the Golden Gate Bridge taken from the San Fancisco side of the bridge. This photograph is taken of the entire bridge a little bit before sunset as you can see the sky start to change colors. The Golden Gate bridge is arguably one of the world's most beautiful bridges as the Golden Gate Bridge is an internationally recognized symbol of San Francisco. 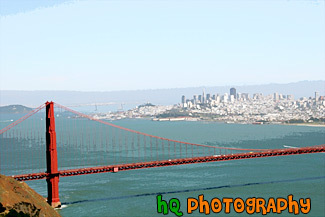 A scenic picture taken of the city of San Francisco through the bars of the Golden Gate Bridge in California. 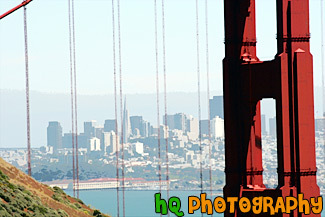 This picture of the Golden Gate Bridge was taken from a place called Battery Spencer in the Marin Headlands. A scenic picture taken of the city of San Francisco, California looking through the Golden Gate Bridge. 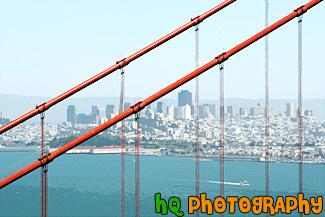 This picture was taken for the Marin County side of the bridge on a bright, sunny day in late spring. In the distance you can see the Bay Bridge, the Transamerica Pyramid, and the rest of the city. 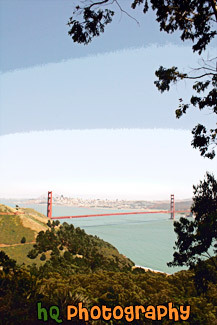 One of the best places to see the bridge is from the Marin Headlands, on the north side of the bridge. 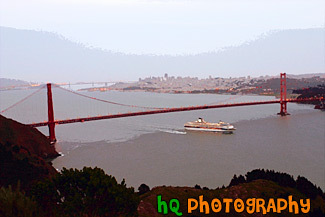 This shot was taken from a place called Battery Spencer in the Marin Headlands. 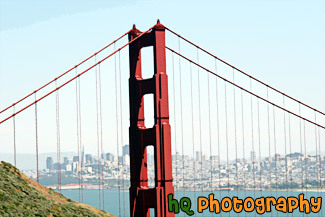 A scenic picture of a close up of the Golden Gate Bridge in San Francisco, California. In this picture you can see the Palace of Fine Arts through the hole of the bridge in the background. A scenic picture taken of the Golden Gate Bridge in San Francisco, California with Alcatraz prison visible on the left upper corner of the picture and some yellow flowers in the foreground. 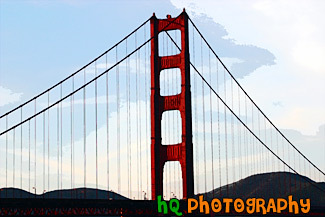 The Golden Gate Bridge is a historic symbol that represents the city of San Francisco. This is a close up scenic photo of the arch of the Golden Gate Bridge just as the sun was about the set - as you can see from the changing colors in the sky. 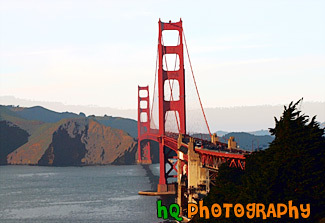 The Golden Gate Bridge is a historic symbol that represents the city of San Francisco. Joseph B. Strauss was the original chief engineer of the bridge and designed a rather unsightly cantilever and suspension structure in 1916. Though attempts were made to refine the design, it wasn't until consulting architects Irving F. Morrow and his wife Gertrude C. Morrow stepped in that the current look and design were imagined and implemented. The bridge opened for traffic 1937. 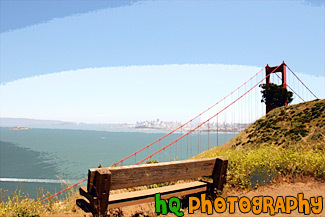 A scenic picture taken of an empty bench and the Golden Gate Bridge off to the right along with the city of San Francisco, the bay waters, and Alcatraz in the background. This picture was taken on a beautiful sunny day. A scenic picture taken of the city of San Francisco, California while looking over a stretch of the Golden Gate Bridge in the foreground. This picture was taken from the Marin County side of the bridge. A scenic picture taken of the entire Golden Gate Bridge in San Francisco with a view of the city behind and a big cruise ship leaving the bay area underneath. This picture was taken at dusk from the top of Hawk Hill which is located just north of San Francisco in the Marin Headlands. 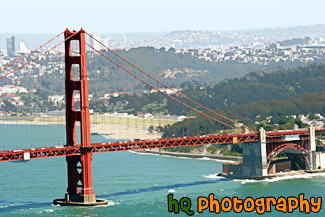 An interesting picture taken of the famous Golden Gate Bridge located in San Francisco, California. 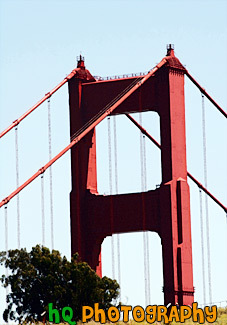 This picture was taken while driving in a car on the bridge looking up at the red frame on a sunny blue sky day. A scenic picture taken of the entire Golden Gate Bridge from Hawk Hill near San Francisco. 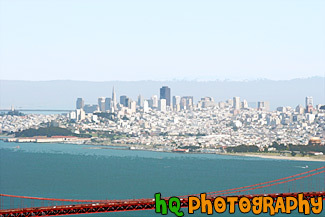 Hawk Hill is located just north of San Francisco, California in the Marin Headlands. From this position you are actually above the Golden Gate Bridge looking down at it and the city. A scenic picture taken of the Golden Gate Bridge in San Francisco, California. In this photo you can see the old prison of Alcatraz located in the bay. 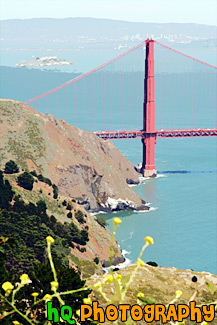 A scenic picture taken of yellow wildflowers located on the sides of a trail leading to the Golden Gate Bridge. You can also see the city of San Francisco and the bay waters in the distance on this beautiful sunny day. 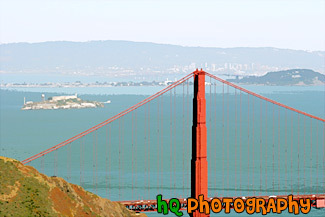 A scenic vertical picture taken of the Golden Gate Bridge from the lookout point on the Marin County side. This photo was taken with clouds seen above the bridge. 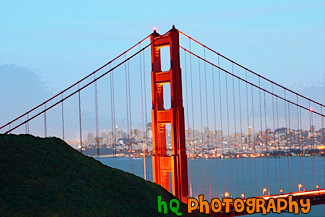 A scenic picture taken of the Golden Gate Bridge in San Francisco, California as the nighttime approaches. You can see the city lights and the bridge lit up in this picture. The is also noticeable behind the clouds. A scenic picture taken of the Golden Gate Bridge which is located in San Francisco, California. This photo was taken from the Marin County side of the bridge looking towards the Pacific Ocean showing the entire bridge in view just before sunset. A scenic picture taken of the Golden Gate Bridge which is located in San Francisco, California. In this picture you can see the tall buildings of San Francisco in the distance. This picture was taken near Hawk Hill in San Francisco. Hawk Hill is located just north of San Francisco, California in the Marin Headlands. From this position you are actually above the Golden Gate Bridge looking down at it and the city. A scenic picture taken of the Golden Gate Bridge and San Francisco from along the Pacific Ocean coast. In this picture you can see the coast and hills of the Marin Headlands along with the Golden Gate Bridge and San Francisco in the background. A scenic picture taken of the Golden Gate Bridge in California. In this picture you can see the city of San Francisco in the background and Alcatraz Island off to the left. 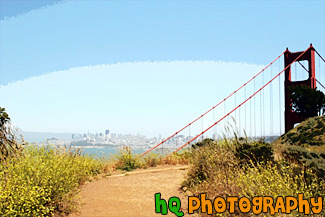 This picture of the Golden Gate Bridge was taken from a place called Battery Spencer in the Marin Headlands. A scenic picture taken of the Golden Gate Bridge with some green shrubs in the foreground. In this picture you can see the entire view of the Golden Gate Bridge along with the city of San Francisco in the background and Alcatraz Island off to the left. 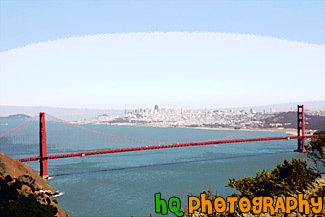 This picture was taken from Hawk Hill which is located just north of San Francisco in the Marin Headlands. 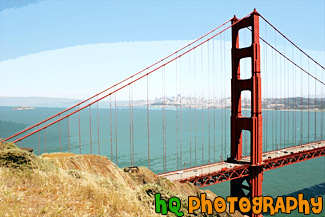 A scenic picture taken of the Golden Gate Bridge located in San Francisco on a blue sky sunny day. This photo is taken of just one section of the bridge. 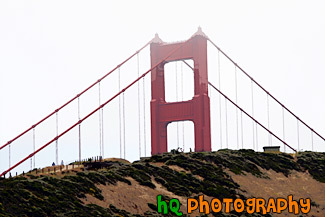 A scenic picture taken of the Golden Gate Bridge on a cloudy day. 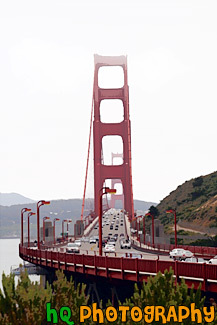 This photo is taken from the Marin County side of the bridge. 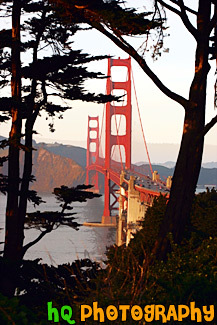 This is a scenic picture taken of the Golden Gate Bridge at the Presidio in San Francisco. It was taken just about as the sun was going to set as you can see from the changing colors in the sky. Today the Presidio is enjoyed by many people through the history and beauty it contains. Within the Presidio boundaries there are more than 500 historic buildings, a collection of coastal defense fortifications, a national cemetery, an historic airfield, a saltwater marsh, forests, beaches, native plant habitats, coastal bluffs, miles of hiking and biking, and some of the most spectacular vistas in the world... not to mention the spectacular views of the Golden Gate Bridge. 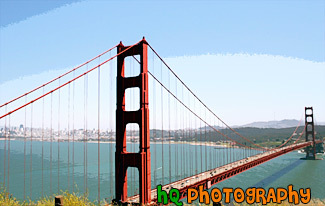 A scenic picture taken of the San Francisco side of the Golden Gate Bridge on a beautiful sunny afternoon. 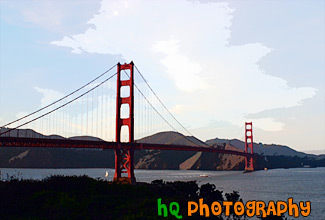 This is a scenic picture taken of the Golden Gate Bridge at the Presidio in San Francisco. It was taken though some trees just as the sun was going to set as you can see from the changing colors in the sky. Today the Presidio is enjoyed by many people through the history and beauty it contains. Within the Presidio boundaries there are more than 500 historic buildings, a collection of coastal defense fortifications, a national cemetery, an historic airfield, a saltwater marsh, forests, beaches, native plant habitats, coastal bluffs, miles of hiking and biking, and some of the most spectacular vistas in the world... not to mention the spectacular views of the Golden Gate Bridge. A scenic picture of a close up of the tip of the famous Golden Gate Bridge located in San Francisco, California on a sunny blue sky day. 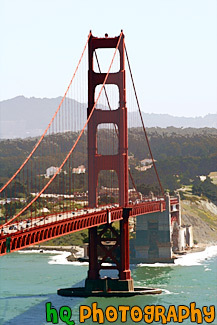 The Golden Gate Bridge is a historic symbol that represents the city of San Francisco. Joseph B. Strauss was the original chief engineer of the bridge and designed a rather unsightly cantilever and suspension structure in 1916. Though attempts were made to refine the design, it wasn't until consulting architects Irving F. Morrow and his wife Gertrude C. Morrow stepped in that the current look and design were imagined and implemented. The bridge opened for traffic 1937. 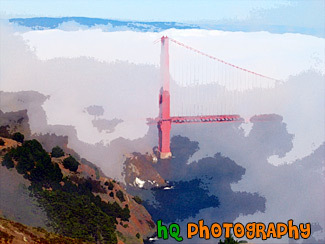 A scenic close up picture taken of the tip of the Golden Gate Bridge which is seen very close to the clouds. You can see how big the bridge is compared to people standing on the hill in which case they look tiny. 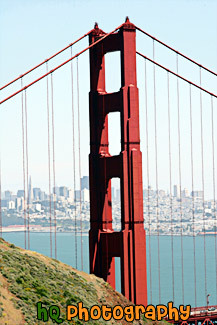 A scenic vertical picture taken of the Golden Gate Bridge during the day with blue sky seen above. San Francisco can be seen in the background. A scenic picture taken of the Golden Gate Bridge in San Francisco, California from the lookout point on the Marin County side of the bridge. This photo was taken with clouds above the bridge. 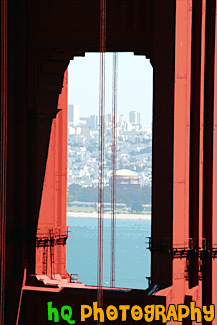 An interesting vertical picture taken of the famous Golden Gate Bridge located in San Francisco, California. 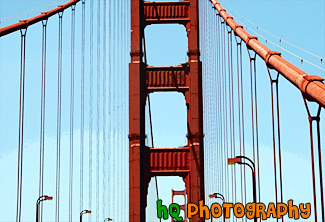 This picture was taken while driving in a car on the bridge looking up at the red frame on a sunny blue sky day. 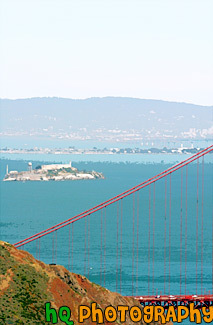 A scenic vertical picture taken from San Francisco on a hill looking towards the Golden Gate Bridge and seeing the island of Alcatraz in the backcground. This picture was taken on a sunny day. A scenic picture taken of the city of San Francisco in the background and the Golden Gate Bridge in the foreground in this sunny fog-free day in the bay area. 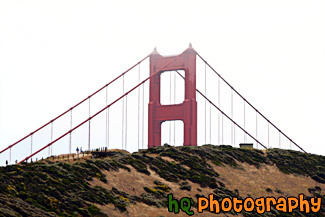 A vertical close up picture taken of the famous Golden Gate Bridge located in San Francisco, California. 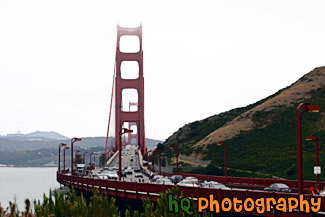 This picture was taken for the Marin County side of the bridge on a bright, sunny day in late spring. In the distance you can see the city of San Francisco. 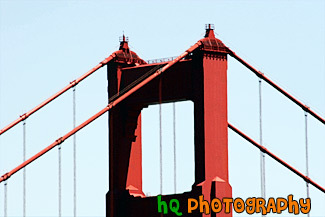 A scenic vertical picture taken of a close up of the tip of the famous Golden Gate Bridge located in San Francisco, California on a sunny blue sky day. 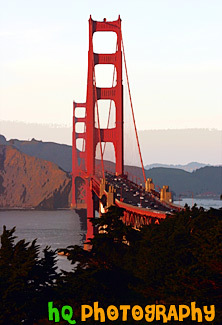 The Golden Gate Bridge is a historic symbol that represents the city of San Francisco. If you look closely in this picture you can see two people standing on the hill just before the bridge. You can seen how tiny these people look in comparison to the great big bridge. A scenic picture taken of the tip of the Golden Gate Bridge behind a hill. You can see people walking on the hill and how large the bridge is in comparison. This picture was taken on a cloudy day. A scenic picture taken of the Golden Gate Bridge in San Francisco, California. 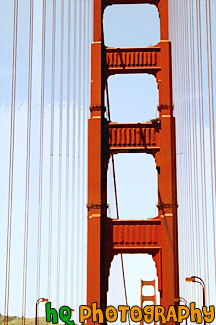 This is a vertical picture of the bridge taken of the San Francisco side looking towards the Presidio. 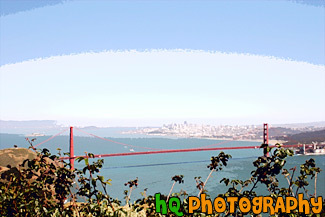 This picture of the Golden Gate Bridge was taken from a place called Battery Spencer in the Marin Headlands. 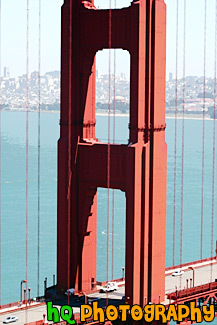 A scenic vertical picture taken of the Golden Gate Bridge close up. San Francisco can be seen in the background.